Tom Hiel is one of several composers who has found a niche composing high-quality scores for low-budget movies for the SyFy Channel. Hiel’s music energized such CGI-laden fantasies as SyFy’s CYCLOPS and ROCK MONSTER (both 2008), with his most recent opus being the highly anticipated SHARKTOPUS, co-produced by Roger Corman. All three films were directed by Declan O'Brien. Hiel’s powerful score gave the film a wonderful sense of gravitas and really energized the drama and added a good deal of coherency to the story. Interviewed last July as he was embarking on scoring the film and then again a few weeks after its debut, Hiel described his musical approach to scoring tooth and tentacles. Q: Tell me about SHARKTOPUS. It’s had quite a buzz going on about it. Tom Hiel: It’s classic Roger Corman. The Navy has contracted a company to engineer a killing machine, half shark/half octopus, that they can control, and of course, running a test with it at the beginning of the movie and it goes awry… and then the thing is running around killing people on the local beaches. Q: What were your initial musical impressions for this movie? Tom Hiel: It’s a straight drama with horrific elements as the Sharktopus attacks, so there are some straight ahead dramatic themes that come into play as they’re looking for the Sharktopus. In a way it’s a low-budget JAWS – I don’t necessarily think the music’s reflecting that, I think there is a throwback to straight-ahead orchestral scoring in this one. Due to the budget, of course, it was all done with electronics. Q: How would you describe the score’s thematic structure and development? Tom Hiel: There is a recurring 4 note rising motif that I used every time the Sharktopus is threatening to attack or in the preliminary stages of attacking. Many times I was able to build that motif for a while as the attacks became imminent. When the Sharktopus did attack I tended to use rising chromatic stabs over brass chords (alternating from lower brass to horns and trumpets) and heavy percussion loops. Also I used glissando effects and sampled sounds (a garden rake across metal) to accentuate the horrific elements of the attacks. After the attacks or when the action was slow but where I wanted the audience to think Sharktopus might be around, I used this electronic pulsing loop that really adds another sonic dimension of creepiness for me. 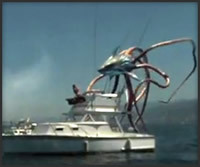 As the boat is racing around trying to find and catch up with the Sharktopus, I used an action theme in the horns with a string and wind ostinato on top along with percussion to drive the action. Whenever we see Eric Roberts character I usually used a repetitive motif in the lower strings and brass along with another percussive loop and some of these electronic loops coming in and out. Later I used electric guitars on the motif to build it out. There was another brass theme I used for him when he was on his large yacht as well. There was all of the Mexican source music and one dance track as well. The End Credits cue has many of the motifs that I used – it's going in the foreign version of the film. Q: Without giving away any of your secrets, what was your technique to use samples in this score to replicate an orchestral performance? Tom Hiel: In all of these films you have to do mock-ups now for directors, and so they have to sound very realistic, and I learned how to do that when I worked for Mark Mothersbaugh and Marco Beltrami. The mock-ups just had to sound so real. I use the East West Platinum sample library, which is a really good library, and there are a bunch of other samples I’ve just accumulated over time, some of them are Vienna [Symphonic Library], some of the electronic stuff was made by me and some of it I actually inherited from Marco’s main guy, Buck Sanders. So it’s a combination. For the melodic strings I used an old Roland string sample. It was made for the Roland 760 and I still use it for the long string sections. If it moves quickly, it doesn’t work, and then that’s where some of the East West stuff comes in handy. Q: How is your writing process affected when you know you are composing for samples rather than having an orchestra to perform it on the other end? Tom Hiel: Actually I think you have to be more inclusive in your composing. When you know you’re going out to an orchestra and you know you’re going to orchestrate it yourself or you have an orchestrator do it for you, a lot of times when you’re in the writing process you can just say, ‘oh, make sure to double the cello lines with bassoons’ or ‘double this with whatever,’ but when you’re actually doing this type of thing with samples you have to go back over and synth-orchestrate as you go, as it were – adding to the cello lines some French horns or bassoon, just things you do when you’re orchestrating to make it sound as thick as possible. You really have to be more in tune with that. I also add electronics. For SHARKTOPUS I was given free reign, thankfully, and so some of those pulsing electronic pads come in and they add so much. 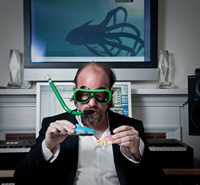 Q: I thought that pulsing synth loop in SHARKTOPUS adds a cool undercurrent of menace. Tom Hiel: That’s exactly it. Ironically I did those loops as a demo for another TV show. I was up for WITHOUT A TRACE, and I had those all custom done for that. They loved that demo so much I went up against every composer in town, and I went all summer long thinking I had the job, but it didn’t happen. So it came in handy to use them here. Q: What was most challenging for you about the SHARKTOPUS score? Tom Hiel: Probably just getting the right feel for some of those attacks. It’s easy to be heavy handed, and sometimes it calls for it to be overly heavy handed, but sometimes you don’t want to do that. Each attack tended to be different enough where you couldn’t cut-and-paste the motifs. Sometimes you needed a building progression – there’s a chromatic ostinato thing that I would do - it’s in the dive sequence, where the strings would play in clusters, and that goes on for a while sometimes, where he’s dragging the body and stuff, and so that ended up being fairly challenging, just finding the right tone on each attack. Q: Original reports back in February suggested that Roger Corman was slated to direct SHARKTOPUS, but you wound up working with Declan O’Brien who you’d worked with on CYCLOPS and ROCK MONSTER. Tom Hiel: I never knew about Roger directing it. Declan told me there was another guy who was directing or maybe he was co-directing with Roger or something, and he quit. That’s when Declan got called in because he had worked with Roger on the CYCLOPS movie; Roger loves that movie and thinks it’s one of his better efforts. So he called Declan and then I got an email from Declan that read, ‘I got another one for you if you’re up for it!’ That was back around February, so it’s very possible that Roger was signed on originally to direct it. Q: How was it working with Declan again on SHARKTOPUS? Tom Hiel: I think the stigma has come from low-budget music for the low-budget films has always sounded hysterically bad. I think it’s come a long way from that now, now that you can write music and record music even at a low budget level that sounds pretty believable and big-budget. That’s the goal, anyway. It’s a little tricky to make it sound like the real thing. That’s half the battle, I think, to make the synthesizers sound the same as what you’re going to be doing orchestrally. Just tricks of the trade that have been in play for awhile now. Q: What happens when you come up against a scene in one of these films that just seems so over the top or so dumb yet you had to treat it seriously in the score? How do you face that challenge? Tom Hiel: For me I always score it straight and try and just pump it up. On SHARKTOPUS, for example, sometimes when you saw it far off, crushing the boat, it was bigger than life, but then when you saw it next to the speedboat it looked more the size of a normal shark, so there were some size and spacial issues going on, but at the same time I didn’t score those scenes any differently – it’s just a big monster and he’s trying to attack. I just tried to make it as believable as possible. There’s a scene where Eric Roberts dies, and that whole scene takes forever. But for me it was actually kind of nice, I got a little chance to do my little thing, and I just scored it straight. Q: What do you find unique about scoring the science fiction genre? How can music support the suspension of disbelief in some of these films you’ve scored?. Tom Hiel: I think music plays a huge role, and it’s challenging just coming up with music that does all that. It’s interesting because in ROCK MONSTER there was a scene where the two knights face off with swords, and the light shines down from above, and if you just watch that scene on its own without music there’s no drama and no impact. Who cares?! 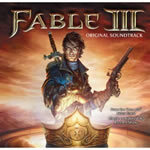 It’s the big fantastical music that really accentuates the whole storytelling aspect of it. I think it plays a very strong role. Music plays a strong role in film in general but harmonically it’s really going to accentuate the science fiction, fantasy film. There’s definitely more music in these types of films – something like seventy minutes of score in SHARKTOPUS; CYCLOPS was wall-to-wall. It has to be carefully crafted too. The wrong music, or cheap music, can just lessen the whole experience. Tom Hiel: Ironically right before this happened I was with ICM [International Creative Management] and the agent there is not going to be representing composers any more so I’m looking around for a new agent. But he had suggested talking to the SyFy Channel and maybe see if there’s a series or something that I can jump on, and I’m going to pursue that. SHARKTOPUS has generated some interest, but I’m still out there pounding the pavement. It’s still kind of crazy trying to get a job! Fernando Velázquez’ score for Edmon Roch’s documentary about “The Man Who Saved the World” – counterspy Joan Pujol, also known as Garbo – is an engaging chamber jazz score, very different from the somber horror scores like EL ORFANATO and DEVIL which the composer has been associated with previously. 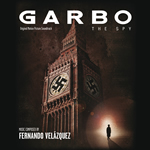 GARBO: THE SPY develops a jazz theme favoring piano and strings which is varied throughout the score with a small jazz combo and a small chamber orchestra. The quirky score gives the film an elegant, sophisticated, and self-assured air very much the equal of its main character, while also reflecting the time period in which much of his story played out. The melody is flexible enough for sufficient variations (the pensive violin bowing of “The Spanish Civil War,” the dark, cloudy portent of “The Nazi Menace,” the introspection of “My Contribution to Humankind” with its somber cello) but the tonality is mostly light and festive, and very listenable. MSM’s album also features a couple of songs by Spanish band RiP and also Velazquez’s own song ‘Mars in Ball” with the composer himself on vocals. The late Joe Harnell continues to be remembered through promotional recordings available through his web site. 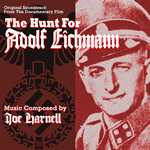 Among these are several albums of his music for episodes of television’s THE BIONIC WOMAN and THE INCREDIBLE HULK, and the score for this 1994 documentary film about the rise to power and subsequent kidnapping and trial of the infamous “Architect of the Final Solution.” Made in Israel, directed by Dan Setton and narrated by Gregory Peck, the 91-minute film contained nearly wall-to-wall music (the double-CD album, in fact, contains nearly 100 minutes of music, suggesting some music was cut for the film’s final edit). Harnell’s music is lively and absorbing, primarily performed by keyboards and synths (a sampled choir is heard in “The Vatican”) but maintaining a fairly Gothic, European musical tonality as well as the requisite amount of “Nazi Drums.” The melodies are provocative even if recognizably synthetic in their performance, but the music remains compelling. The score begins with a throbbing low synth pulse over bristling, sizzling snare drums and other percussion in “Escape/Main Titles” [Eichmann escapes from US Army custody], who and the next few tracks are very militaristic as the film flashes back to cover Eichmann’s early career. That introductory throbbing synth beat recurs as a kind of ostinato for the predatory Nazi, reprised in “Wannsee Conference” [the 1942 Berlin meeting where the Final Solution was believed to have been first mapped out], and from low, gonglike synth patterns on “Eichmann’s Early Life,” while “The Plan” and “Final Solution” are treated more sympathetically by focusing on their victims with poignant melodies set beneath the dominating, continuing snare drum pattern, musically suggesting the innocent Jews beset by the iron hand of the Nazi regime. The score’s main theme is introduced in “Eichmann arrival,” a faux tango for a synth melody over concert piano, snare drum, and castanets, assuming an elegant and self-assured sensibility and capturing the Nazi’s arrogant swagger. It recurs frequently as the story plays out, changing focus to reflect the intensity of the Israeli’s in seeking and apprehending Eichmann, lending a provocative degree of drama to these sequences, while the castanets also evoke the sound of the Latin American setting. Rachel Portman has composed a sublime score for Mark Romanek’s film based on Kazoo Ishiguro’s science fictionesque novel about a trio of women who grow up in a society where people are cloned in order to become organ donors. The science fiction elements take a back seat to the predominant drama that focuses on the women and their relationship and eventual acceptance of their roles in this society. Portman emphasizes the emotive expressiveness of the story with a wistful and serene theme for strings (violin and cello mainly) over piano that runs throughout the score in a number of variants and poignant reflections. The theme maintains traces of melancholy throughout; despite the loveliness of the melody its interpretation is tinged with a slight worry or regret as it mirrors the doubts faced by the characters, concluding in the haunting elegy, “We All Complete” (“complete” being the story’s euphemism for death) as they grow to accept their role with grace and dignity. The score’s gentleness washes across the soundscape in warm caressing waves, its compelling tone and richness of performance giving it a mesmerizing quality that will surely sustain frequent listens. It’s a beautiful work, capturing the inner selves of these characters and articulating them with us across the soundscape, as Rachel Portman is so strikingly adept at doing. One of John Williams’ first major scores which for years went without a soundtrack release of any kind, has finally been given its full measure in La-La Land’s recent complete score recording. Expanding FSM’s 12-track 1998 soundtrack (the 1972 score’s first soundtrack release), La-La Land proffers the complete stereo score in 16 tracks, with an additional dozen alternate tracks, including three versions of the Al Kasha/Joel Hirschhorn hit song, “The Morning After” (the film version, sung by Renee Armand, which is what Carol Lynley lip-synched to in the movie; an instrumental take, and the ’45 version by Maureen McGovern), and three other tunes from the film’s pre-capsized party scene. But, of course, it’s the score that is the big thing here, and Williams’ provided a mesmerizing orchestral score, rich in deep timbres and a main theme that captured an undulating rhythm suggestive of the surging liquid masses of the open sea while also suggesting the courageous spirit of the heroes as they struggled against the odds to survive. The theme, its elegiac main fanfare as well as its more rhythmic variation allowed for plenty of dramatic variations in its wavelike, rising/falling melodic structure. 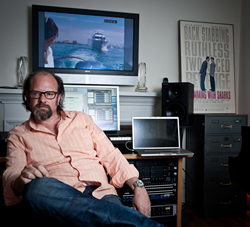 Williams’ music associated with the wave that overturns the ocean liner is especially provocative, but its echoes are felt throughout the remainder of the film as he accompanies the attempts of the survivors to reach safety and await rescue with the same depths of rhythm and texture, continuously associating the characters and the threats they confront with the omnipresent character of water, and lots of it. When the dangers our heroes face become more mechanical and industrial as they climb deeper into the overturned vessel, the score assumes a harsher, more atonal and shrill sensibility, although the water motif is frequently reprised (“Hold Your Breath,” etc. 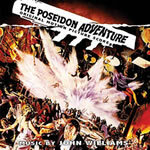 ), but the score is a massive composition from the awesome encounter with the rogue wave to the triumphal, concluding rescue and Williams’ music is simply thrilling from start to finish. While tracked differently, both releases in fact contain about the same amount of actual score music (about 37 mins); La-La Land’s having the advantage of a decade’s improvements in restoration technology to allow the entire score, plus the unreleased alternate takes, to be presented for the first time in stereo (FSM’s was mostly from a monophonic backup due to then-unrepairable damage to the stereo masters). Along with La-La Land’s expanded reissues of such significant scores as BATMAN, INDEPENDENCE DAY, INNER SPACE, GREYSTOKE, and DRAGONSLAYER, POSEIDON ADVENTURE resurrects a significant – indeed, essential – film score from a major composer, and is most welcome. Album notes from Jeff Bond enhance the package, nicely designed by Mark Banning, with background on film and its music, and a track-by-track commentary. 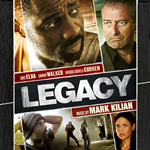 Thomas Ikimi’s action thriller, LEGACY, dealing with the aftermath of an anti-terrorist soldier’s capture and torture as he settles back into civilian life, is given a potent psychological underscore by South African-born composer Mark Kilian whose work on BEFORE THE RAINS, LA MISSION, and, with Paul Hepker, RENDITION, has been well regarded. 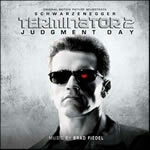 The soundtrack will be released digitally by Lakeshore Records on October 19th. “To give the sense of psychological breakdown and the loss of reality,” described Kilian, “the music never lets the audience settle into a comfortable thematic development pattern, but rather keeps the ‘nail on chalkboard’ idea throughout where many sounds are not quite ‘right.’” Kilian accomplishes this through on consistent percussive pulse, often set against a fragile electronic rattle or rapping, sustaining an ongoing pensive ambiance that maintains a palpable sense of unease. “The score features an exciting blend of retro flavored orchestral writing reminiscent of Bernard Herrmann's work with Hitchcock and a modern electronica sensibility applied to the writing and manipulation of acoustic and electronic instruments and percussion,” explained Kilian. The mixture of the fluid Herrmannesque chord progressions with the burbling pulsation of the percussive electronica makes for a score that is broodingly provocative and simultaneously jarringly insistent (“Reunited” is one of the most striking cues in this regard, managing to be both romantically flavorful and aggravatingly unsettling). As a result the score may be best served by its filmic context than its listenability on disc, but its ability to affect the home listener is also a tribute to the effectiveness of the music’s ability to capture a potent sense of disturbiana. A few of the tracks are embellished by a female melisma, which gives the grittier electronica elements a haunting serenity; sans the vocal, the melancholy piano performance in “Valentina” is also quite persuasive, and Kilian’s “Prologue” is especially captivating as it incorporates a variety of interesting musical textures, from rough-edged fiddle, toy piano, lithe female intonations, buzzing synth pads, tom-tom fills, and a veritable Blue Man Groups’ worth of diverse percussive sources. David Newman has composed a far darker horror score for this 1991 horror film than the lighter, comedy-based scores for which he was becoming best known in the early 1990s. THE RUNESTONE told of an ancient Norse prophecy and the release of an ancient deity that will bring about Ragnarok – the end of the world – unless a New York cop can vanquish the demon. Released earlier this year by Perseverance (and available now in pretty limited supplies), the score is an effective hybrid of synths, recorded in Newman’s studio, and orchestra, performed by a 70-piece ensemble recorded at Columbia. While there was no attempt to disguise the electronic origins of the synth music, Newman was quite adept at creating a rich orchestration based on motific development and interaction, giving synths plenty of space to create their unique sonic textures while also combining them with the orchestra in the grand Hollywood filmscoring tradition. 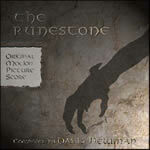 Director Willard Carroll, a fan of Roy Webb’s scores for the subtly spooky Val Lewton horror films if the 1940s, asked Newman to come up with a similar thematic approach, which Newman was more than happy to oblige (Daniel Schweiger’s comprehensive album notes relay in far greater and fascinating detail just how Newman conceived and structured the RUNESTONE score and should be read in entirety for a thorough appreciation of this film and its score). Based on a single, and very compelling main theme, Newman’s score is as relentless as the ancient Norse creature who thunders in from the Nordic cosmos to impose Ragnorok upon the modern age, and as stalwart as those heroic characters who stand against it (Newman even squeezes in a clever statement from the horror movie music staple, the Dies Irae (Day of Wrath), as the creature meets its final comeuppance in “They Kill Fenrir”). Newman’s melodic sensibility provided a horror score that is dramatically potent yet enjoyable to listen to and powerful enough to achieve a semblance of swashbuckling horror as story and score get going. Take “Fenrir Reigns Terror” as one short example, near the album’s end and one of the score’s dramatic highlights: Newman begins with a blaring intonation of his main theme for horns over drums, segueing into a pattern of percussive pads over which high brasses tune up with fragments of the central motif, growing into a furious array of strings performing with aggression which lead into a huge rendition of the main theme for brass over everything else in a propulsive, thunderous presentation that builds to a massive crescendo but instead dissolves into the quiet, cold air of silence. A thoroughly splendid, satisfying, and dazzling composition and performance. Now imagine an entire album of such musical might. This is just what you have here. In their fifth box set, this one weighing in at a hefty 14 discs, FSM has thoroughly mined the musical legacy of STAR TREK: THE NEXT GENERATION, focusing on the episode scores of Ron Jones, one of the three primary composers on the series (Dennis McCarthy and Jay Chattaway being the other two). With fourteen discs, 526 tracks, and more than 16 hours of music, this massive project borders on overkill, and its size and expense will likely deter many. But for those willing or able to take the plunge, this is an amazing gallery of the musical style and scope of ST: TNG, at least as per Jones. Inevitably there are those tracks that aren’t that interesting apart from their visual compatriots, that become redundant or monotonous in their support of absent visual activities, but there’s so much more that is quite fascinating. 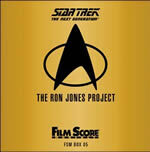 Most of the tracks seem to be action or incidental/suspense cues, and Jones frequently riffs on both the introductory fanfare from Alexander Courage’s main STAR TREK theme as well as the melody line, usually in restrained refrain, of Jerry Goldsmith’s STAR TREK: THE MOTION PICTURE theme, but not so much to the point of unwelcome repetition; Jones displays his mastery of grounding the music in thematic references even while embarking on action-heavy material. The scores of TNG, and this is generally true of McCarthy and Chattaway as it is of Jones, were not so heavily into sweeping melodies as were the motion pictures; while Jones quoted the themes often enough to keep the audience immersed in the familiar music of the Roddenberryverse, the use of music at least during Jones’ tenure on the show (Jones departed TNG in its fourth season; Chattaway assumed his duties through the show’s seventh and final season) tended to be fairly subdued and incidental, but Jones did find opportunities for profound melodic poignancy (the elegiac “Tasha’s Goodbye” from the first season’s “Skin of Evil,” wherein Lt. Tasha Yar meets her end, is one of the show’s finest musical moments; “Mission Forward,” heard during the finale of “The Neutral Zone,” is a rousing heroic fanfare, concluding TNG’s first season with the promise of further adventures to come; “Worried,” the opening track from Jones’ first second-season episode (episode 2, “Where Silence Has Lease”), proffers an especially elegant and reverent fusion of the Courage and Goldsmith themes, with a serene refrain from the French horns; the lovely “True Meaning” from Season Two’s “Loud as a Whisper;” and so on. There’s lots of music and lots of imaginative variations on theme and motif to keep the orchestra and synths active. The set is accompanied by a 60-page booklet (early buyers got it autographed by Jones) with introductory notes by FSM’s Lukas Kendall and Jeff Bond, and includes fistfuls of alternate and additional tracks, plus Jones’ music from the STAR TREK video games STARFLEET ACADEMY and STARFLEET COMMAND. 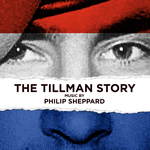 Philip Sheppard, noted for his documentary score for IN THE SHADOW OF THE MOON, has provided an affecting and poignant musical score for Amir Bar-Lev’s THE TILLMAN STORY, a documentary about Pat Tillman, a collegiate athlete who gave up his professional football career to join the Army Rangers in 2002; Tillman was killed by friendly fire in 2004, his death the subject of an Army propaganda cover-up (see: http://en.wikipedia.org/wiki/Pat_Tillman#Death ). 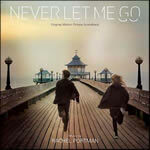 Lakeshore has already released the soundtrack digitally with a CD release due in stores on October 26th. The score eschews dominating melodies but rather builds its persuasive accompaniment through a kind a ringing, atmospheric pulse, with an underlying percussive or plucked beat that runs through much of the music. In his album notes, Sheppard writes that “To mirror the censored documents shown on screen I ‘redacted’ many of the notes of the melodies themselves, leaving a framework of pulses and spaces. Other musical sequences were originally written with a string central theme, around which a quiet musical frame forms an accompaniment. In these pieces I then intentionally removed the lead theme and recorded the musical space that was left – an imprint of something or someone no longer there.” The score avoids dramatic commentary on either the part of Tillman, his family, the military, or the larger background of the Afghanistan and Iraq wars but lays down a consistent undercurrent of musical sound that energizes the depictions and dramatizations. “In scoring the film I didn't want to apply a heroic sheen to the seductive images of sport and war, as this would only be adding to the myths that this film so eloquently deconstructs,” Sheppard noted. “In writing documentary music I believe it is the composer's job to lead the viewer to a place where they can think, but not to tell them what to feel, so in a sense the music has to act as a clean slate, a tabula rasa. “This is essential in a story where the original facts of the matter have been distorted and re-imagined in the first place.” While the sense of rhythm and the suggestion of imprint were central to his musical approach, there remain a few significant musical moments that soak through the fabric of pure objectivity: the stalwart trumpet of track 2, “Lux,” suggests the rugged athleticism of Tillman’s character (the trumpet is later reprised in “Military Ceremony”); “Fallout” sets down the score’s darkest air of somber ambiance, as the Army’s story begins to unravel; “Jessica Lynch Waltz,” for a sequence involving the rescue of another soldier whose wartime experience became the subject of Army propaganda and controversy (Tillman’s first mission in Iraq was the hyped-up rescue of Lynch from an Iraqi hospital), appropriately gives the episode the flavor of a choreographed dance; “Into the Valley” is a hauntingly fatalistic cue with low, dark timbres proceeding furtively over a slapping-percussion backdrop. An elegant string quartet performs “The Hearing,” lending it a stately backdrop, until a disturbing counterpoint is imposed from synth and electronic percussion, as the truth again unravels the elegant lie. “The Afghan” provides a semblance of middle Eastern musical idiom; its sinewy string line is later incorporated into “Total Champion II,” reprising an earlier motif that assumes a tragic irony in its reprisal with the Afghan texture woven through it. “Chorale for Pat” contains some marvelous string writing, as electric violins, doubled by a touch of their own feedback, convey an elegy on Tillman’s behalf as score and movie make its final tribute to Pat: man, soldier, American, son, brother; a promising life, cut short, abused in death. 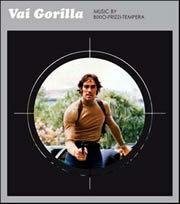 Tonino Valerii’s 1976 crime thriller, VAI GORILLA (US: The Hired Gun), about an undercover cop positioned as a bodyguard for a shadowy crime boss, featured a jazzy, rocking score from the songwriting/composing team of Fabio Frizzi, Franco Bixio, and Vince Tempera. Previously released only as a 45-single on Cinevox, Chris’ Soundtrack Corner provides a healthy 20 tracks, 18 of which are hitherto unreleased, including four that were never used in the movie. Typically for the Bixio-Frizzi-Tempera trio, the music is funk/rock styled and keyboard dominated, embellished by a ferociously vibrato string section and allowing for some flavorful jazz rhythm section work, providing a contemporary vibe and urban energy that mimics pretty closely the sound then popular in American blaxploitation films of the day. As writer John Bender details in his thorough set of album notes, Italian composers during the ‘70s composed scores like this “wild” – providing to the director a master tape of music based on the film and its story, but not composed to screen. Thus when the score was edited into the picture, inevitably much of the recording was truncated to fit the timings of the final scenes, leaving plenty of music on the cutting room floor; and allowing for the soundtrack album to represent the music in its fuller form. VAI GORILLA is a great example of American funk reprocessed through Italian cinematic sensibilities, imitating a blaxploitation sound within the fusion of urban rock/jazz/pop that was so prevalent in Italian crime films of the mid ‘70s. Bender’s notes are essential reading to a proper assessment of the score and what it does; but even on its own the music creates a thematic architecture that propels the hero, his girl, and the various villains through the story to their inevitable climactic confrontation and resolution. 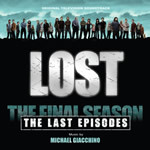 In addition to releasing a 2-CD soundtrack of Michael Giacchino’s LOST Season 4 music (reviewed last column), Varese Sarabande has announced a limited edition addendum, LOST: The Final Season: The Last Episodes, a further 2-CD set that now joins LOST: The Final Season to conclude the label’s presentation of music from LOST's final sixteen episodes. 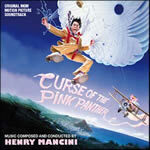 CD 1 of The Last Episodes features music from The Candidate, Across The Sea and What They Died For, while CD 2 is devoted solely to the epic and emotional concluding episode, The End (this, incidentally, brings Varese’s LOST soundtrack series to a whopping ten discs covering all four seasons). La-La Land Records has just released a limited edition premiere CD release of John Scott’s music to the 1984 Tarzan retelling, GREYSTOKE. An attempt to be more faithful to the original Edgar Rice Burroughs novels that previous cinematic incarnations of the character have been, Scott’s score gave the story a classical elegance that contrasted as much with his more violent jungle music as the film did in depicting the dichotomy between the titled noble, Lord Greystoke and the savage yet free Tarzan, Lord of the Apes. Also released is an expanded 2-CD reissue of John Frizzell’s score to ALIEN RESURRECTION, the final ALIEN movie until the xynomorph versus predator franchise took off, and Frederik Widemann’s score for the new horror film, MIRRORS 2. 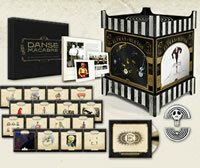 If recent box sets from FSM and other labels have been impressive and out-of-reach: wait till you see what Tim Burton and Warner Bros have cooked up: The Danny Elfman & Tim Burton 25th Anniversary Music Box, a very special limited-edition, numbered box “Collectors Edition” of 1000 that collects expansions of the 13 original scores that Elfman has composed for Burton's iconic films. This is a newly-produced library of 16 CDs each packaged with artwork by Burton, adding up to more than 19 hours of music, including 7 hours of previously-unreleased Masters, demos, work tapes and other rarities. With a price tag of $500 and a design that would challenge storage in any collector’s shelving, the impressive package may be out of reach for many, but essential collecting for Elfman fans who have the wherewithal. Electronic Arts Inc. has recruited award-winning composer Ramin Djawadi to create a deep and meaningful audio experience for the modern combat first-person shooter, Medal of Honor™. 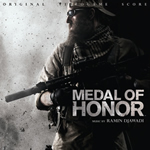 Known for his recent work on the first IRON MAN movie, the PRISON BREAK television series and the remake of CLASH OF THE TITANS, Ramin Djawadi is developing a score to match the intense soldier’s story and Tier 1 experience told throughout Medal of Honor, which takes place in the current war in Afghanistan. For the first time in its 11-year history, Medal of Honor leaves the World War II theatre and enters the modern day setting of war-torn Afghanistan told through the lens of a small band of fictional characters.